SonntagsBlick offers entertainment on Sundays with exciting news, facts and articles from around the world – professionally edited by creative journalists in Switzerland and abroad. And all this in an appealing three-section concept: news, sport and the SonntagsBlick Magazin, reaching more than a half million readers. The stories that SonntagsBlick prints on Sunday are only published by other papers on Monday. It’s a compass. It’s life. It’s a trusted source for everyday life, politics, the economy, culture, entertainment and sport. The handy format is also perfect for the bus, train or relaxing at home. Our creative layout sets new standards in the European media landscape. 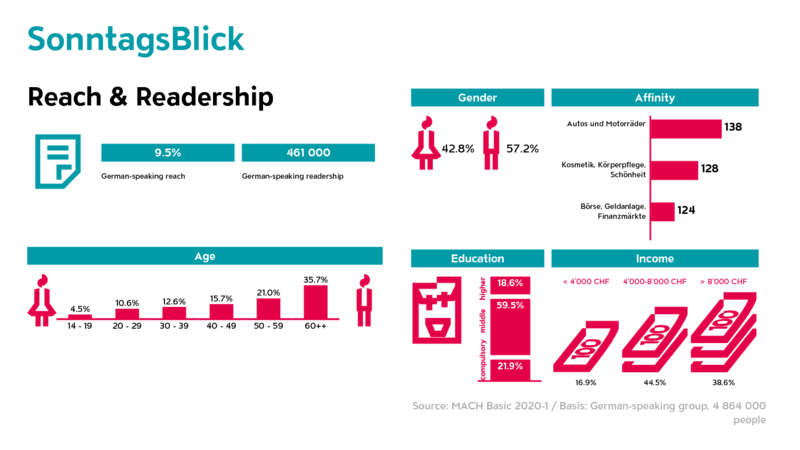 In addition to the printed SonntagsBlick, the Blick Group also reaches people over the online portals Blick.ch and Blickamabend.ch, apps such as Blick News und Sport, BlickVR, Blick E-Paper, and social media channels such as Facebook, Twitter and Instagram. Blick round off the Blick Group portfolio. Bei bundüberlaufender Schrift links und rechts vom Bund 1.5 mm Abstand. Placed at the bottom of an editorial page. Surrounded on two sides by editorial copy. Prices valid from 1 January 2019 for orders from in Switzerland; all prices in CHF plus VAT. Have your advertising insert glued into Blick. The basic price for an insert and fixed insertion fee is CHF 4 000. We would be happy to send you detailed information. If an exclusivity right is required for an insert on the date of publicaton, the insert fee will be increased by 50%. Inserts weighing over 125 g on request only after clarification of the technical possibilities. Dummy The final approval of every order depends on the timely submission of a binding sample. Delivery Only within the week of publication. Tuesday at the latest. Container	 Loose inserts with title page on top in packs of up to at least 50 copies, unpackaged and unbound and stacked on EUR pallets. In layers of 8 to 10 cm (grip height) in pallet frames. Cumulated annual gross* expenditure at Blick & SonntagsBlick in CHF. SonntagsBlick only. No size changes, 1/4 page maximum. Change of subject/text for complete advertisements only. discounts, etc. No AC/YTP from 35%.